Take Command LightHouse 3's easy-to-use interface will put you in complete command with just a few touches. Watch for updated versions of RayRemote and RayControl in your device's app store when LightHouse 3.1 is released. Performance targets bait, fish, thermoclines and more at depths to 5,000 feet. Sonar Scroll Back Rewind, pause and playback recorded sonar history to take a closer look fish and structure, and easily plot waypoints. Enjoy powerful sonar output up to 2 kilowatts and dual, independent transceivers on CP570. Axiom Pro's quad core processor delivers instantaneous response and the ability to run multiple apps simultaneously without any slowdowns. Use the optional GA150 antenna accessory (Sold Separately) to boost GPS reception onboard vessels with enclosed pilothouses or metal construction where the MFD does not have a clear view of the sky. Axiom is ready-to network with all the latest electronics using standard NMEA2000 and NMEA0183 connectivity. 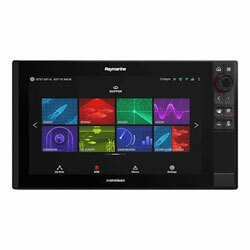 Technology & IPS Displays Raymarine optical bonding technology and IPS Display panels give you stunning color, clarity and contrast in all lighting conditions. Plus, Axiom Pro looks great even through polarized sunglasses. Dimensions: 17.8" x 10.2" x2.72"